NYC, 02/08/2019, 1:00PM. Race (2016): Running Against Hitler in Berlin. 134 min. Director: Stephen Hopkins. 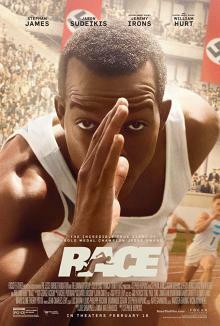 Starring Stephan James, Jason Sudeikis, Eli Goree. Race won four Canadian Screen Awards, including Best Actor for James. Principal photography started on 24 July 2014, in Montreal, and on location at Olympic Stadium in Berlin.